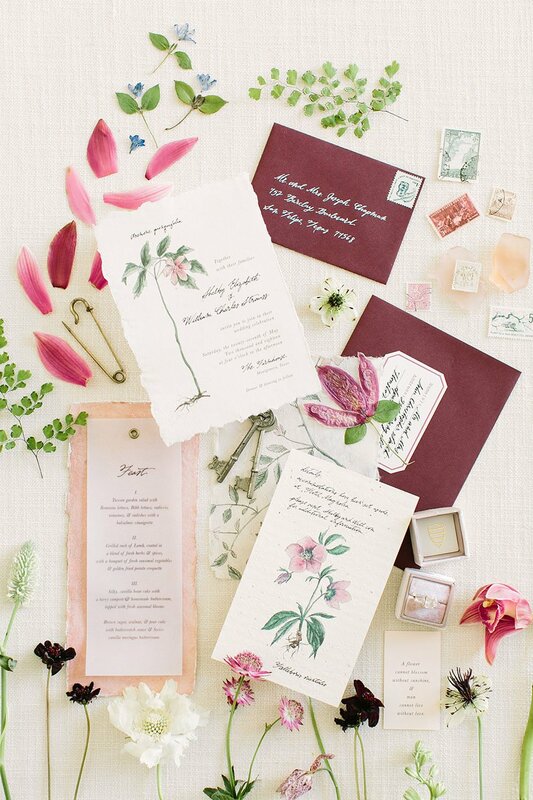 Your invitation suite is so important: it’s the first correspondence your guests receive, and it can set the tone for your big day! 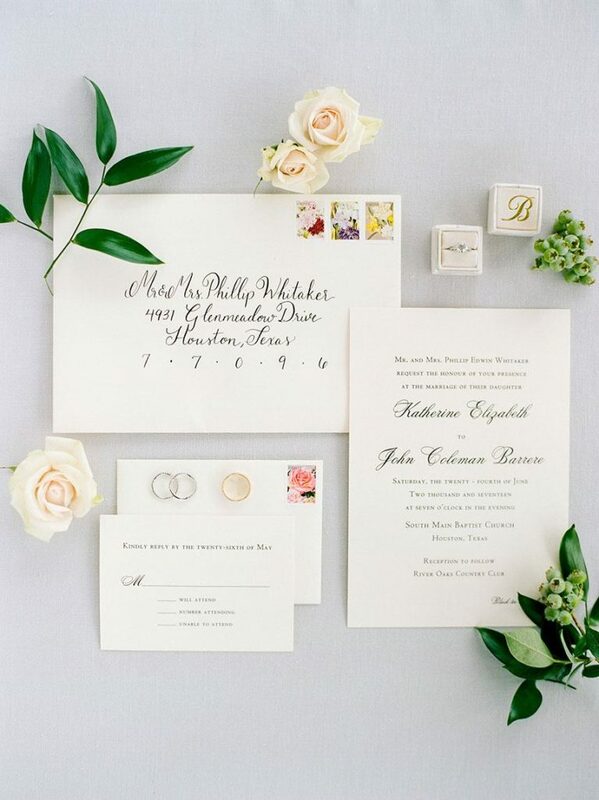 We’ve included plenty of invitation suite inspiration in our inaugural issue of Brides of Houston and today, we want to introduce you to the fabulous invitation designers behind them! 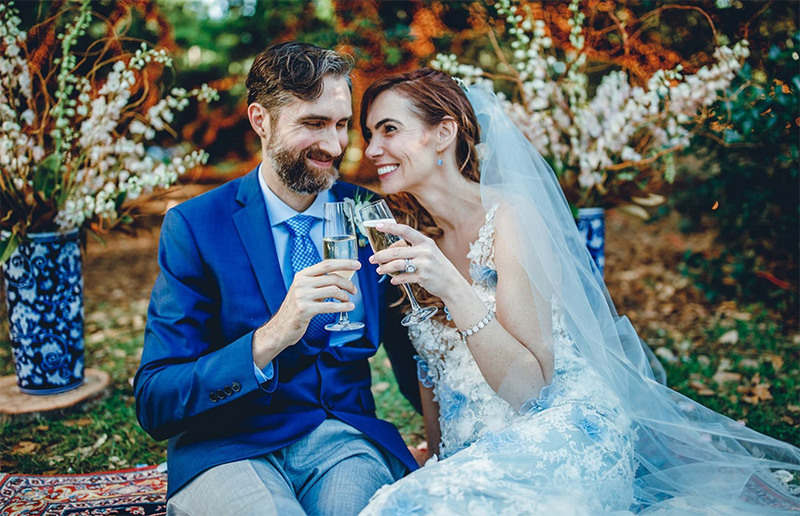 We’re continuing our Meet the Mag Creatives series with more on each of the incredibly talented Houston wedding invitation designers whose gorgeous creations can be seen throughout the Fall/Winter 2018 magazine. 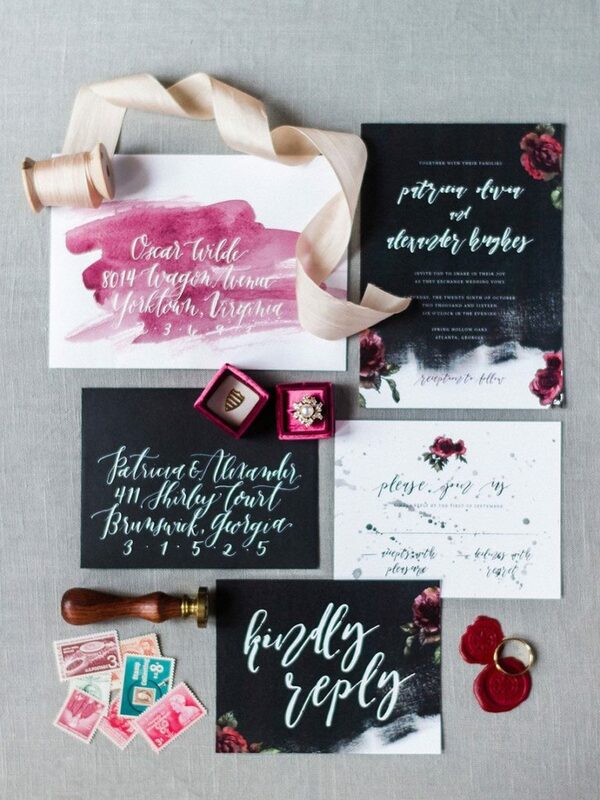 Whether you’re a fan of dreamy, old-world-inspired calligraphy, modern typography or something in between, these designers and calligraphers can help to articulate your vision and make it come to life on paper, beckoning your guests to a celebration of a lifetime! Scroll through the images below to see beautiful suites featured in our latest issue, and find even more stunning details in the brand new issue! 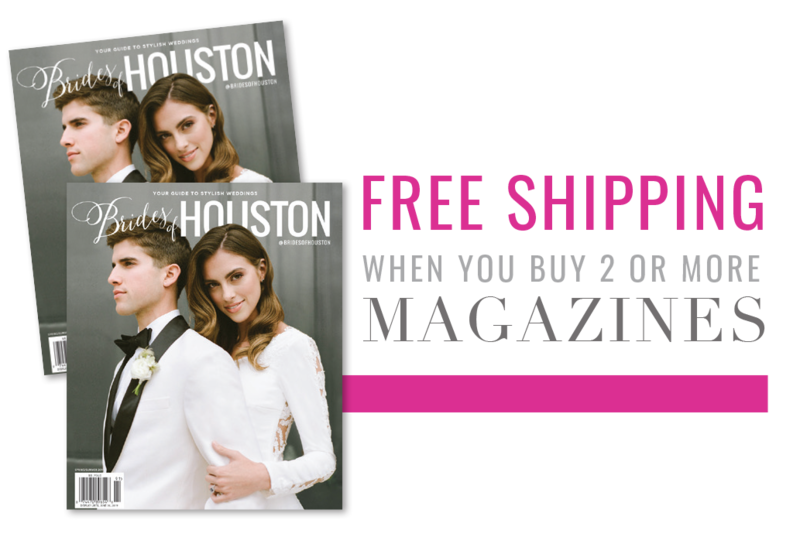 Check out the Fall/Winter issue virtually via the digital mag and if you want to start your mag collection, get a physical copy here! Cheers! 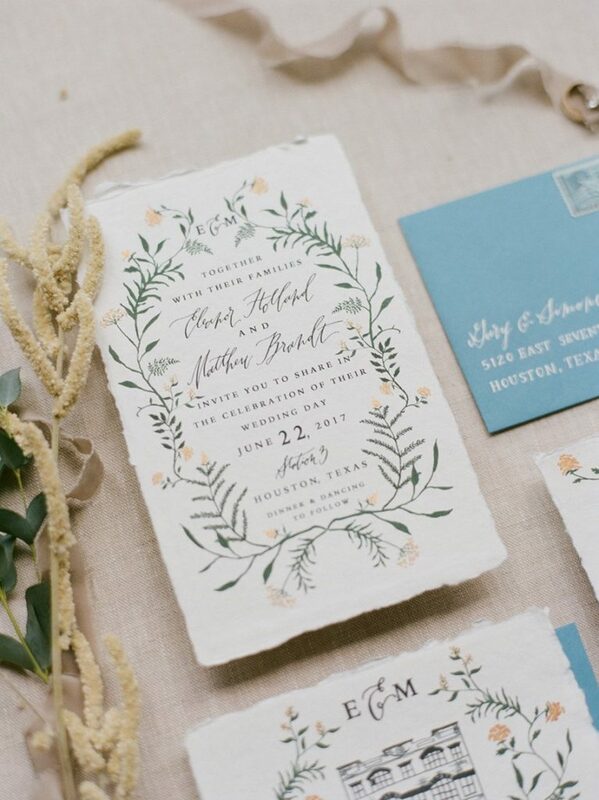 While Half Moon Lettering’s design studio specializes in custom stationery, their background in fine arts allows them to provide couples with a wide array of design and art needs for their big day. 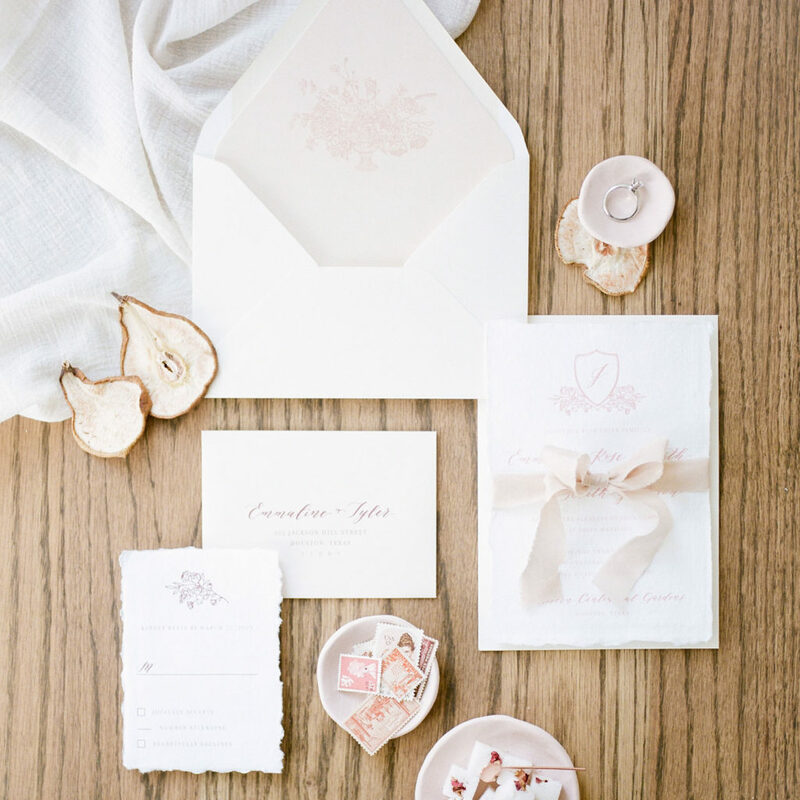 Working with brides and grooms to build each element of their stationery by hand ensures a truly unique style, tailored to each individual couple – the most special way to set the tone for your wedding! 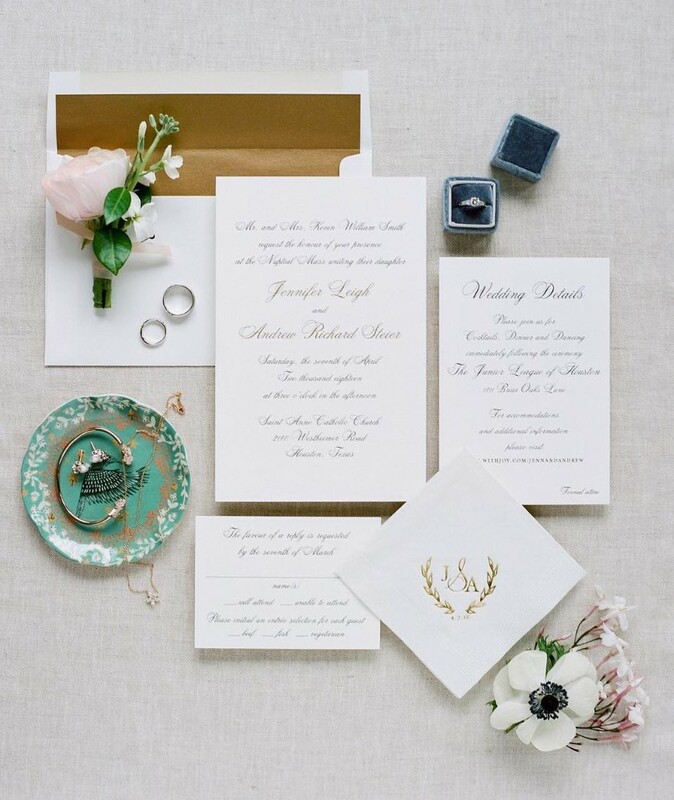 With paper goods, signage and other hand-designed details, you’re sure to achieve a cohesive and eye-catching look. 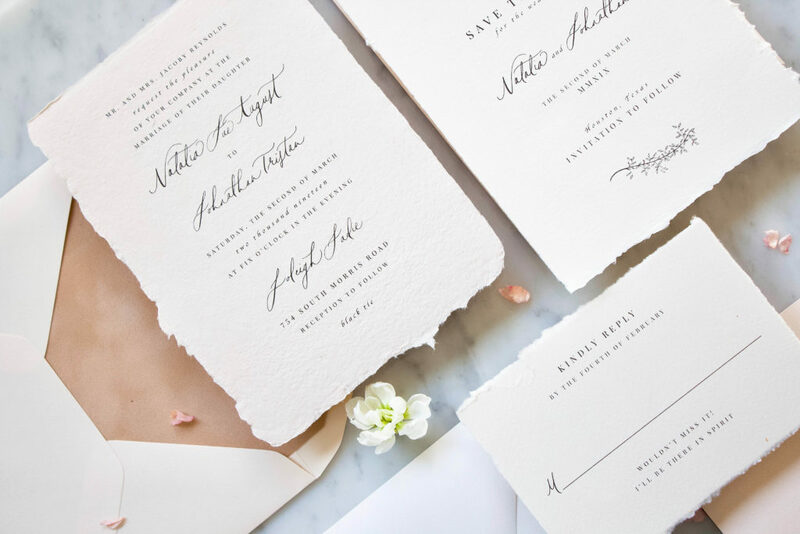 Owner McKenzie of Paper Tie Affair and her precious canine assistants, Bentley and Bella, believe your wedding invitations are more than just stationery: they represent who you are, together. 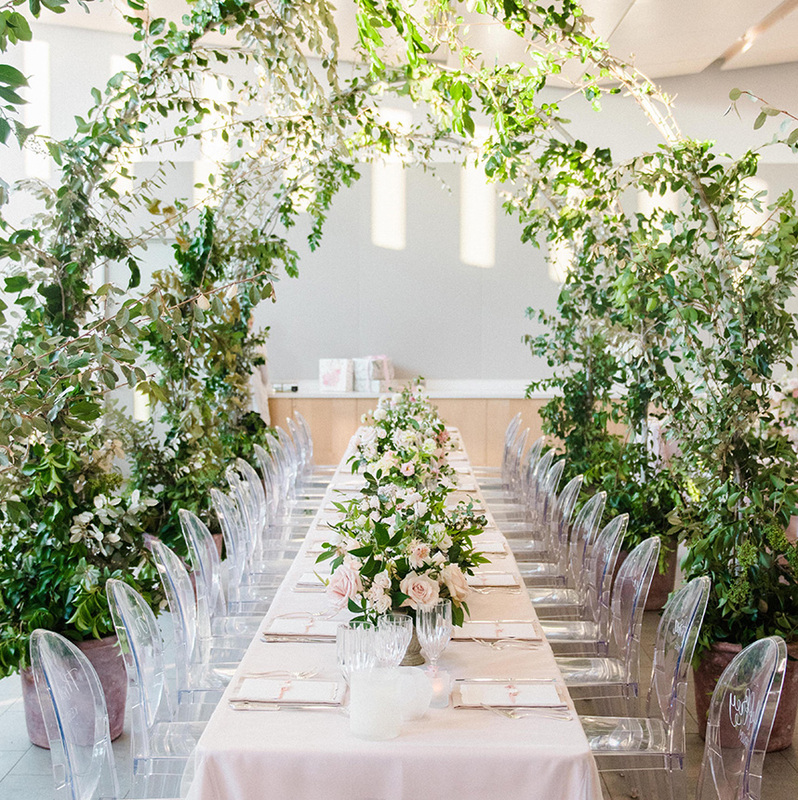 Their custom products are designed and produced in-house, allowing for a tailored experience and exceptional customer service for a stress-free planning process where your vision comes to life! 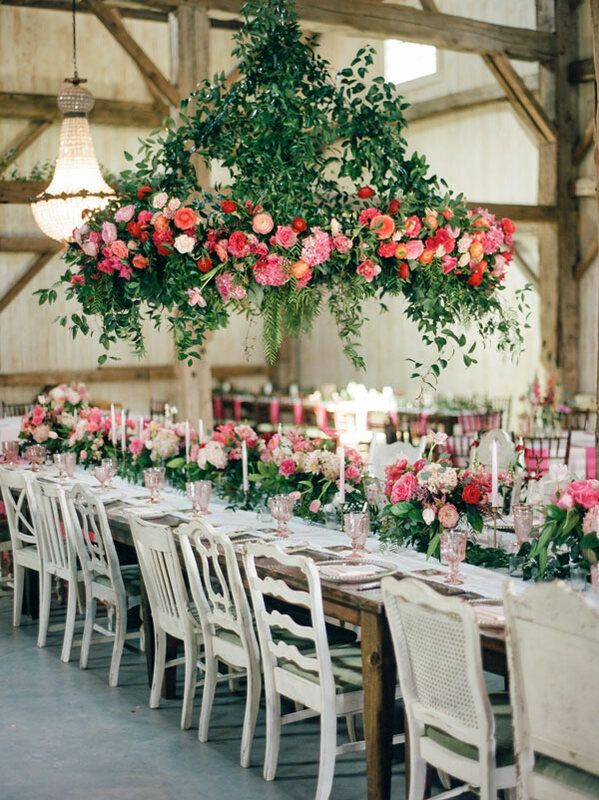 They can also provide coordinating save the dates, programs, signage and more. 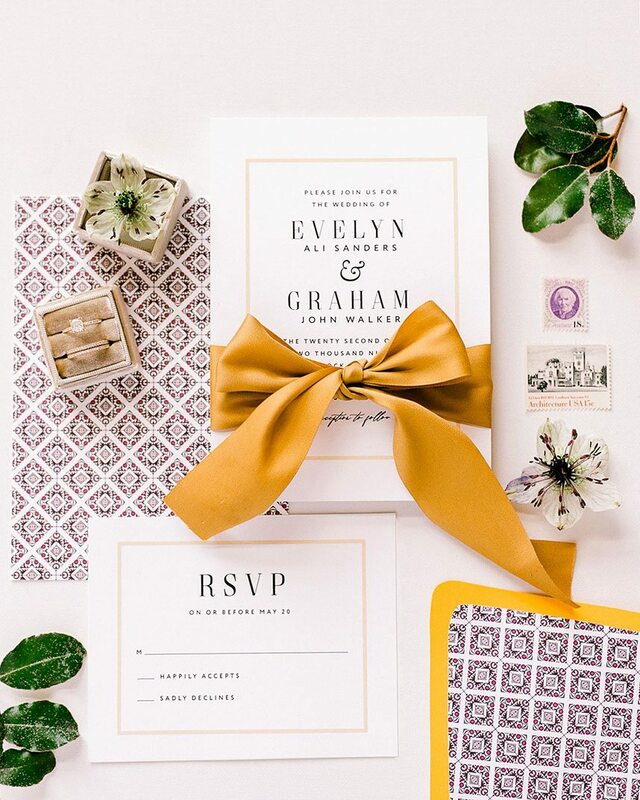 Allow the team at Bering’s Fine Stationery to provide you with all of your stationery and signage needs for your wedding, from invitations to custom memory books and everything in between! 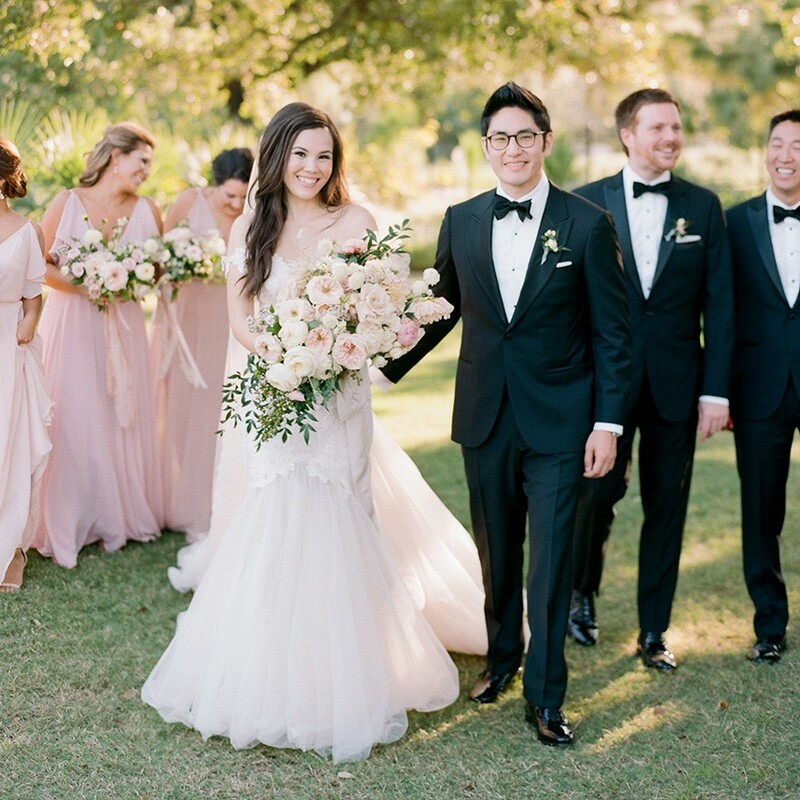 Bering’s has been known for their unique shopping experience and hospitality among the Houston wedding scene since 1940, and they’re here to help with an array of your wedding day needs! 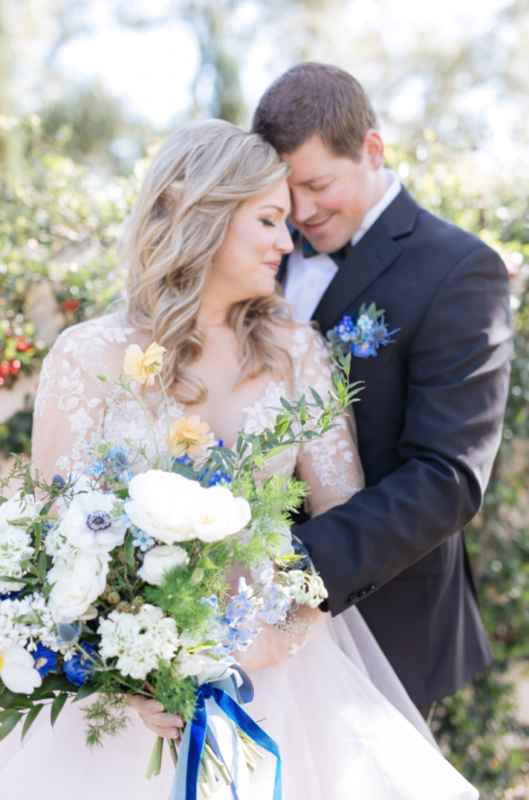 Owner Cassie’s goal for Dreams & Nostalgia is to create heirloom paper goods and handmade details that help you to cherish one of the biggest celebrations of your life. 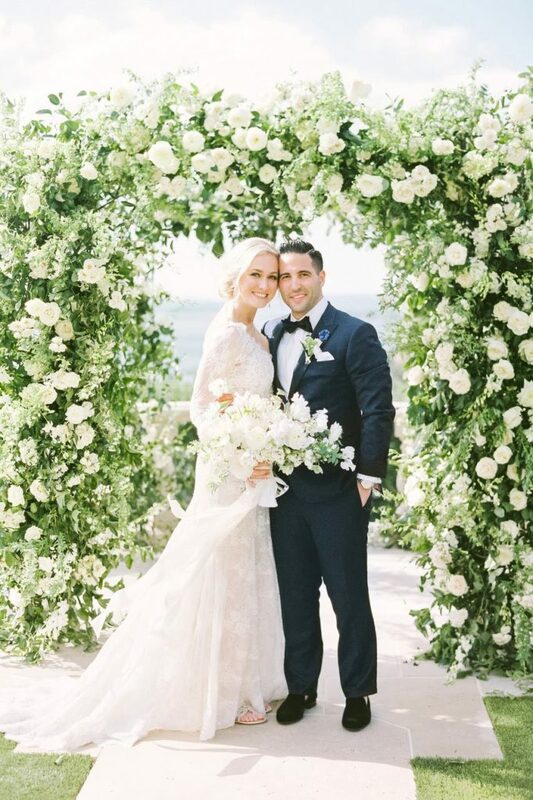 She aims to bring together elements of your personalities and your styles to tell your story in way that showcases you as a couple while making your guests feel appreciated. 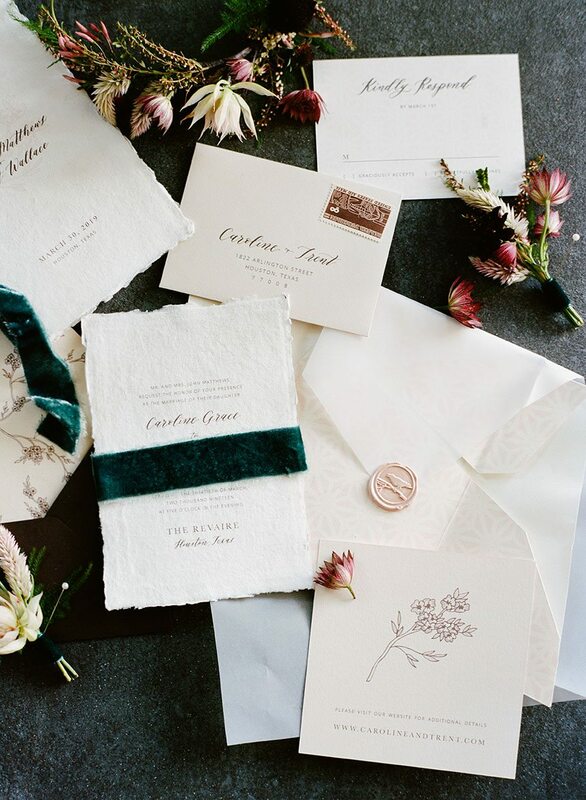 Dreams & Nostalgia’s services include custom stationery, semi-custom invitation suites, invitation assembly services, envelope addressing, calligraphy, signage and more! 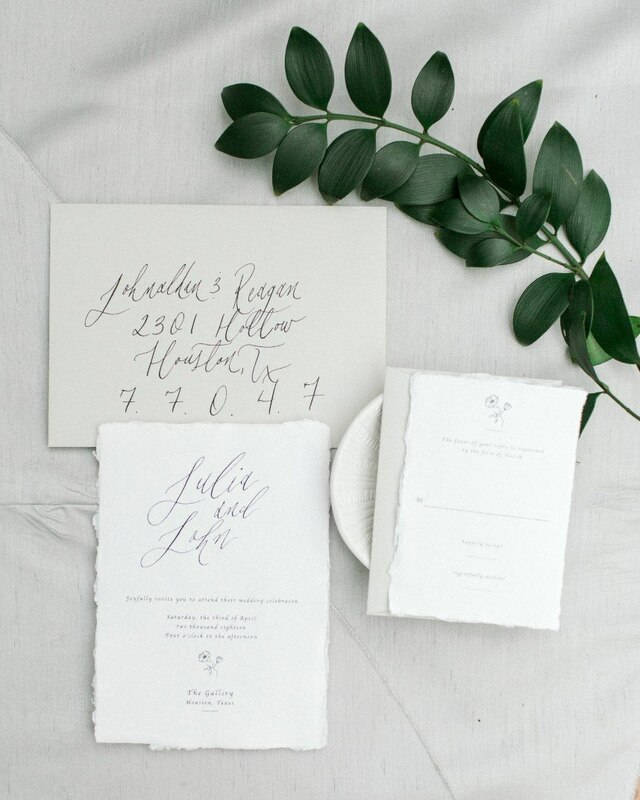 A full-service design and calligraphy shop based in Houston, each custom wedding suite they excitedly design is a direct reflection of the couple’s unique style. 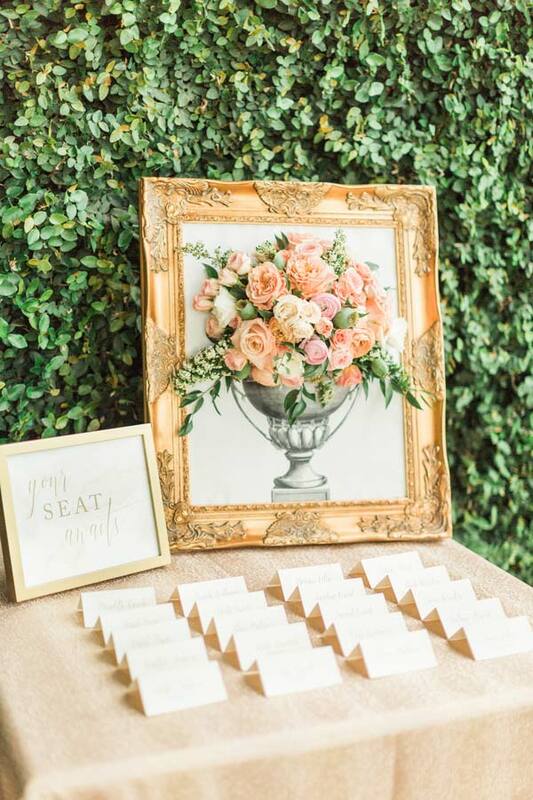 Owner Ashleigh strives to incorporate your wedding details for a cohesive aesthetic, along with modern touches like luxe embellishments, new printing techniques, custom colors, unique typography and more. « Previous Post: Design a Diamond Giveaway – Cast Your Vote for our Top 12 Finalists!